Before I went to bed on Saturday, I made the simple yeast dough and let it rise in the fridge overnight. I woke up the next morning by a text message from one of my skating buddies. He said “training in 45 minutes, will you be there?”. Thank you weather forecast for being wrong. I was still in bed and it would take me 25 minutes just to drive there! I was too groggy to think straight and said yes immediately. I traded in my rolling pin for skates and helmet without a second thought. Skating went alright and my concussion symptoms have not returned. 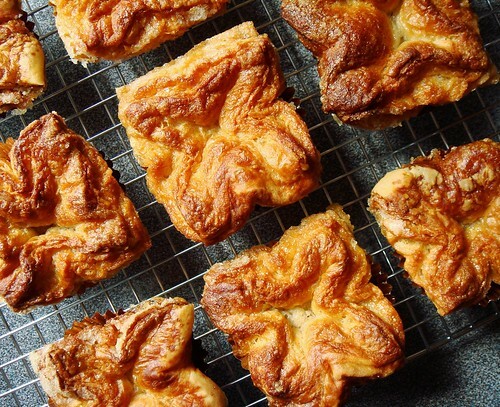 By the time I got home, it was close to noon and I was seriously short on time to get my kouign amann done before evening plan with friends. 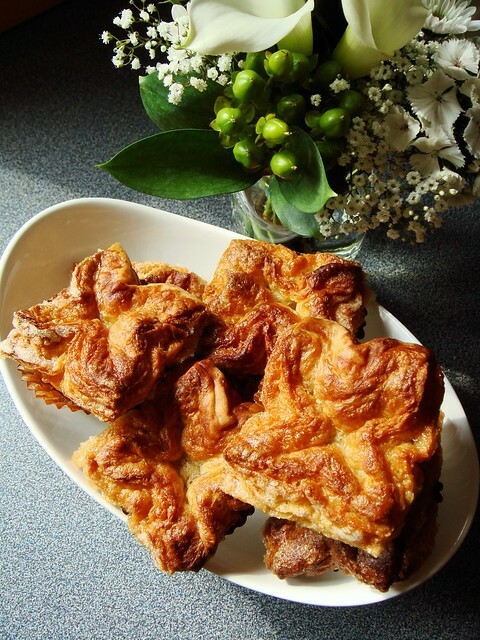 I rushed through the folding and turning without letting the dough rest in between. I had good reasons though. First, my house was cold and the butter was in no danger of leaking. Secondly, the dough was very pliable and stretched easily without too much coaxing. I let it chill in the fridge for 30 minutes before rolling out to 12x16 inch. That yielded 12 4-inch squares of dough. 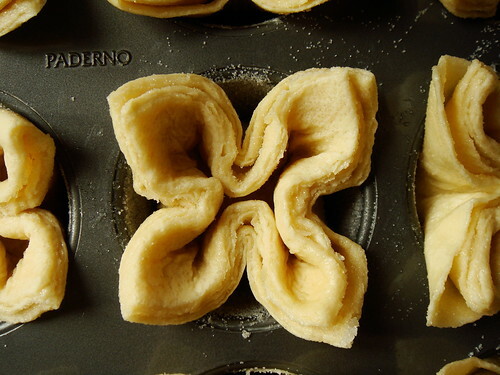 I eased the dough into the buttered and sugared muffin tin into an attractive 4-leaf clover manner. 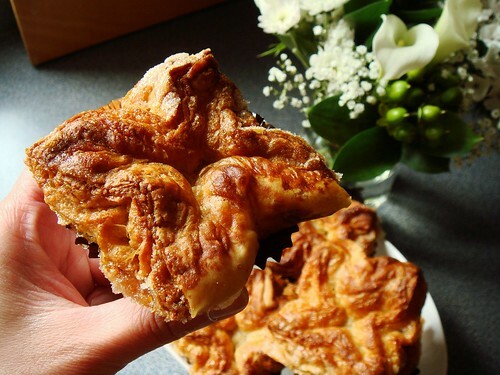 I briefly considered hiding a small piece of dark chocolate inside some of the kouign amann but stopped myself in time for this over the top act. The smell of butterscotch during baking was incredible. I was working on another project in the kitchen and the fragrance was driving me nuts. I think this can only mean one thing. 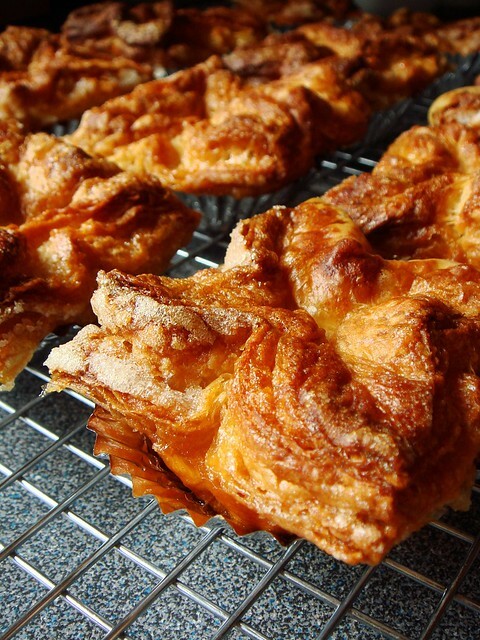 I have not yet conquered kouign amann and I am more motivated than ever to try again until I get it right. Lucky for me, I have a lot of friends who don’t mind taste testing along the way. Feedback is important for improvement, you know?